How does the outdoor space surrounding your home affect your life? The landscaped areas around a house are very different from the interior rooms. Although we may change the color of our walls from time to time, the landscap is changing constantly. New England, with four distinct seasons, offers a potential kaleidoscope of textures and colors throughout the year. The first crocuses breaking through the snow in March offer a hint of what is to come. Watching trees leaf out brings the promise of a shady spot to relax on warm summer days. 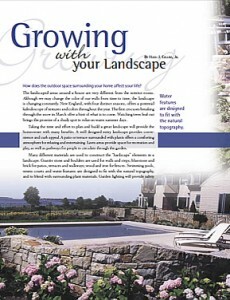 Taking the time and effort to plan and build a great landscape will provide the homeowner with many benefi ts. A well designed entry landscape provides convenience and curb appeal. A patio or terrace surrounded with plants offers a comforting atmosphere for relaxing and entertaining. Lawn areas provide space for recreation and play, as well as pathways for people to circulate through the garden. As we get to know the plants in our garden through observation and care, they become an extension of ourselves. As they grow, we grow. As they bloom, we bloom. Many different materials are used to construct the “hardscape” elements in a landscape. Granite stone and boulders are used for walls and steps; bluestone and brick for patios, terraces and walkways; wood and iron for fences. Swimming pools, tennis courts and water features are designed to fi t with the natural topography, and to blend with surrounding plant materials. Garden lighting will provide safety along pathways, and extend the use of outdoor areas in the evening. Garden ornaments such as statuary, sculpture or mobiles provide interest throughout the year. In addition to the more tangible benefits of a garden, there is much to be gained from experiencing and enjoying nature and the cycles of growth. It’s magic to watch flowering perennials grow year after year, disappearing during the winter and then breaking forth in full bloom in the spring. As we get to know the plants in our garden through observation and care, they become an extension of ourselves. As they grow, we grow. As they bloom, we bloom. This experience can be both exhilarating and calming. The tension that results from our anticipation of spring is released during the warm days of summer. The brilliant colors of fall create an excitement that fades into nostalgia as the leaves fall off. This cyclical process of ever-changing growth and renewal is always available to us. Nature is a powerful force which energizes and calms, as it exerts its influence on our lives. A garden can provide inspiration, hope and joy in all seasons because plants are always growing, always changing. In addition, the birds and animal life that are attracted to various plants offer a never-ending show of movement and color. There is nothing quite like sitting quietly for an hour and observing the activity and listening to the sounds of wildlife in a garden. A functional and harmonious outdoor living environment surrounding your home will relieve stress that may result from today’s lifestyle. Jot down “spend some time in my garden” on your schedule, relax and enjoy!